Things are running rather smoothly in the high tech manufacturing industry in Brainport. Even so, this is no guarantee for the future. The region and the manufacturing industry in particular have their own challenges. As a result, the complexity of systems and products continue to increase and innovation is becoming more expensive. Moreover, fierce international competition is putting enormous pressure on costs. 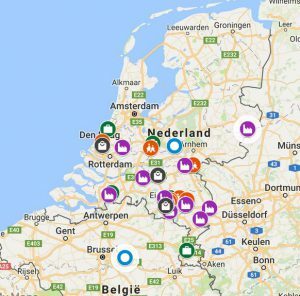 If the enterprising manufacturing industry in Brainport wishes to maintain the lead, it must take action. Clever collaboration is the only way to realise the ambition and to ensure the future of the High Tech region. It is crucial that the OEMs, educational institutions, manufacturing companies and engineering companies in the supply chain put products of the right price and quality on the market. It is thereby of utmost importance that at the start the correct design processes are chosen to ensure the most effective and efficient manufacturing processes. The Knowledge Sharing Centre is both a physical and virtual platform that effectively bundles together the knowledge of the four parties. 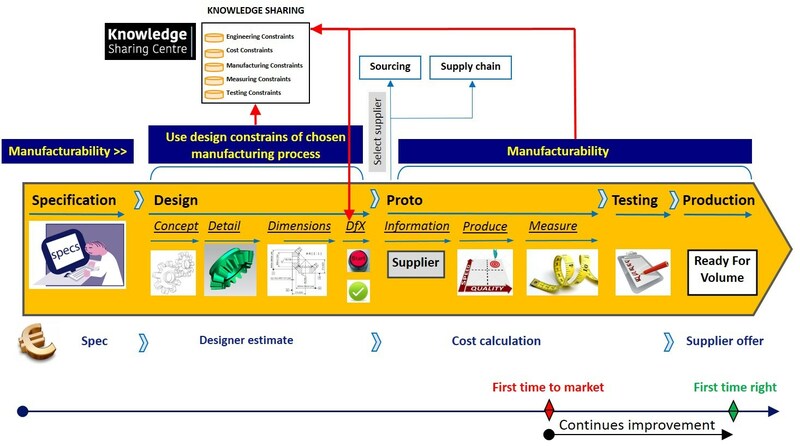 The Knowledge Sharing Centre will apply the V-model for modelling the manufacturing process. The V-model focuses on the designing of effective parts and machines with strict observance of the right knowledge of all manufacturing processes. Through the Knowledge Sharing Centre the four parties can share and develop knowledge. Following extensive investigation it appears that up to 60% of available knowledge in a platform can be shared without compromising competitiveness. Explicit knowledge is knowledge that can be readily articulated, codified, accessed and verbalized. It can be easily transmitted to others. Most forms of explicit knowledge can be stored in certain media. The information contained in encyclopedias and textbooks are good examples of explicit knowledge. Implicit Knowledge is knowledge that is gained through incidental activities, or without awareness that learning is occurring. Some examples of implicit knowledge are knowing how to walk, run, ride a bicycle, or swim. Tacit knowledge is the kind of knowledge that is difficult to transfer to another person by means of writing it down or verbalizing it. For example, that London is in the United Kingdom is a piece of explicit knowledge that can be written down, transmitted, and understood by a recipient. However, the ability to speak a language, knead dough, play a musical instrument, or design and use complex equipment requires all sorts of knowledge that is not always known explicitly, even by expert practitioners, and which is difficult or impossible to explicitly transfer to other people. A good plan of the knowledge of your organization is very important. The correct use of knowledge leads your organization to a better future. Make a difference between general knowledge and protected knowledge. Use protected knowledge or IP (intellectual property) knowledge optimally within your organization to make your organization stronger. General knowledge can be used as marketing for your organization. The manufacturing industry has an important role during the development phase. Helping a designer with taking the right choice when it comes to manufacturing processes. It is important to convert your knowledge into the right design constraints. He needs to know the design constraints of the production process which he is using in his design. 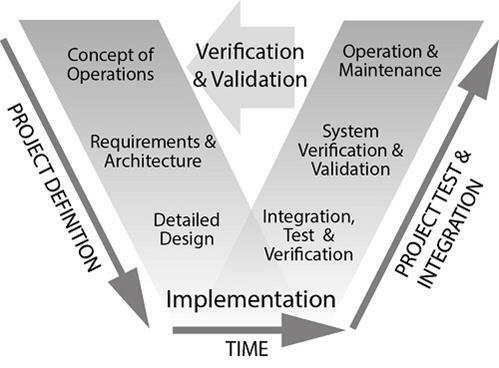 A design constraint is a prerequisite for the relevant production process. A designer does not have to be able to perform the process himself. A global understanding of the process and the constraints is sufficient. As a specialist you do not have to worry about giving away your intellectual property. A designer doesn’t need that much information about the process. Just enough feeling and directions to ensure the using of the right process. A producer can use this information as marketing for his process so he is asking for more attention for his process. Knowledge sharing within the platform enables each party to connect with another party in order to make the right decisions, in particular when it comes to the design process. Therefore, the platform is to align all phases of this process seamlessly, fluidly, realistically and with full control of costs, in the most efficient and effective manner possible. 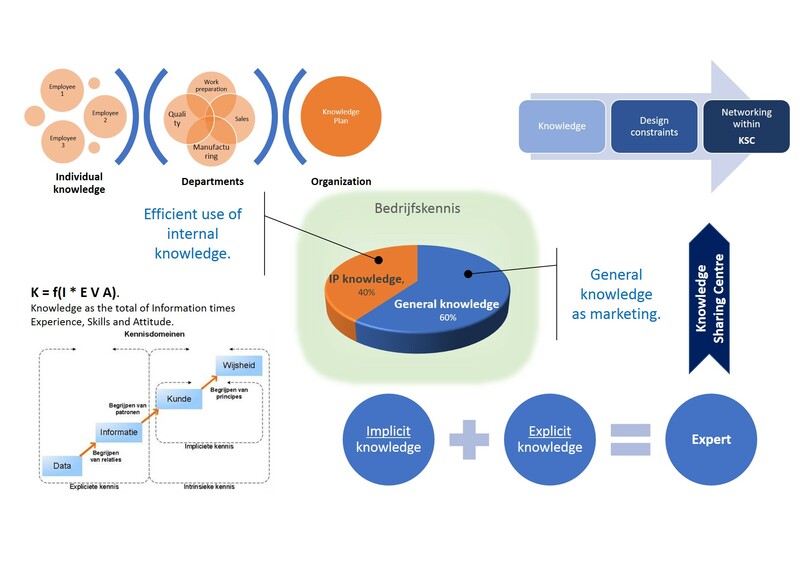 In technical terms the form of the Knowledge Sharing Centre consists of an interactive database containing approximately 60% of the participants’ knowledge. This 60% of public knowledge is required to be able to find the remaining 40% company-specific knowledge, in order to enter into bilateral contact. This website is not a digital catalogue, but rather a digital campus where companies can easily find specialists to help advance them further and where a win-win situation for the companies will arise.